Big and fluffy, these are a must for soft pretzel lovers. 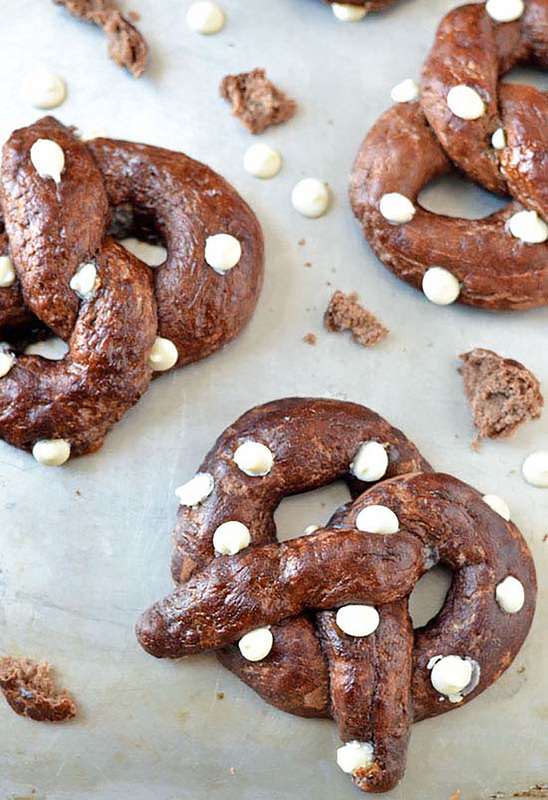 The dough has a light cocoa flavor and the white chocolate chips are baked on both the inside and the outside for maximum chocolate impact. With no egg wash and only 15 minutes of rise time, these homemade soft pretzels will be ready in less than an hour! Make the Dough: In the bowl of a standing mixer fitted with the paddle attachment (or a large mixing bowl), combine the white whole wheat flour, cocoa powder, sugar, yeast, instant coffee, ½ teaspoon salt and warm water. Mix the ingredients on low speed or stir by hand with a wooden spoon or dough whisk, until combined. If using a standing mixer, switch to the dough hook. (If mixing by hand, continue with wooden spoon/dough whisk.) Mix in 1¼ cup all-purpose flour until incorporated. Continue to stir in the remaining ½ cup all-purpose flour, one tablespoon at a time, adding flour just until the dough is lightly tacky but no longer sticky. (All of the remaining flour may not be needed.) Knead dough for 5 minutes by mixer, or about 7 minutes by hand on a lightly floured surface. Knead in ½ cup white chocolate chips a little at a time, just until evenly distributed. Place rack in the upper and lower thirds of the oven and preheat to 425°F. Line two baking sheets with parchment paper or silicone mats. Lightly flour a knife and cut the dough into 4 equal parts. Then, cut those 4 parts into 2 parts each so that you have 8 pieces total. Lightly dust a work surface with cocoa powder. Roll each piece of dough into a long rope that is even in diameter and 20-22 inches long. Most of the white chocolate chips will gravitate towards the center of the rope, which is OK (white chocolate chips that are too exposed may scorch.) To form the pretzel, lay the rope horizontally, then pick up each end and draw them upwards as if you were forming a circle that connects at the top. About 2 inches from each end, twist the rope ends together to close the circle, forming a full twist all the way around (the rope that starts on the left should end on the left.) Draw the twist down into the circle, then adhere the loose ends to the bottom of the pretzel at the 5 o’clock and 7 o’clock positions. Repeat to make eight pretzels. Press the ends lightly to hold the shape. In a shallow bowl or pie dish, beat the egg with 1 teaspoon of water and remaining ½ teaspoon salt to create an egg wash. Dip each entire pretzel into the egg wash, flipping to coat both sides. Place each pretzel on the prepared baking sheet and let rest 15 minutes. Pretzels will puff slightly. Bake for 10 to 12 minutes, until the pretzels darken and an instant read thermometer inserted in the center registers 190°F. Remove from oven. While pretzels are still warm, lightly press the remaining ¼ cup white chocolate chips onto the outsides to decorate. Storage Tip: Place pretzels in an airtight container or zipped-top bag for up to 4 days (though they will lose some softness) or wrap tightly in plastic and freeze for up to one month.